Happy New Year! Did you know long noodles are said to be good luck for the new year? I didn’t until recently but after hearing this I knew that my Superfood Mushroom Ramen Bowls would be perfect to share with Meatless Monday falling on New Years Day! In China, Japan and other Asian countries, it’s customary to eat long noodles, signify longevity, on New Year’s Day. From the coastal American South to Europe, people eat green leafy veggies on New Year’s Day because of their color and appearance, which resembles money. Belief has it, the more you eat, the more prosperous and healthier you’ll be! Even more mushrooms, functional mushrooms, like the ones I used in these Superfood Mushroom Ramen Bowls are suppose to be one of the top food trends for 2018. Honestly though I had planned to share this recipe the beginning of December. Things got busy, other recipes pushed it aside, and I took the last almost two weeks off. I had planned to take off a week but after we all got struck with the cold/flu and high fever the week before Christmas I ended up not posting one last recipe before Christmas that I was already debating on and then took last week off to spend time with the family, rest, and reset. I had plans on getting a few things together to share with the new year but decided not to do any work and even time off social media. It felt good to just take a much needed break. Although now I have that catch up mode but focusing on being positive in the new year and spending time on things that matter most in life and bring me joy not that drain me. 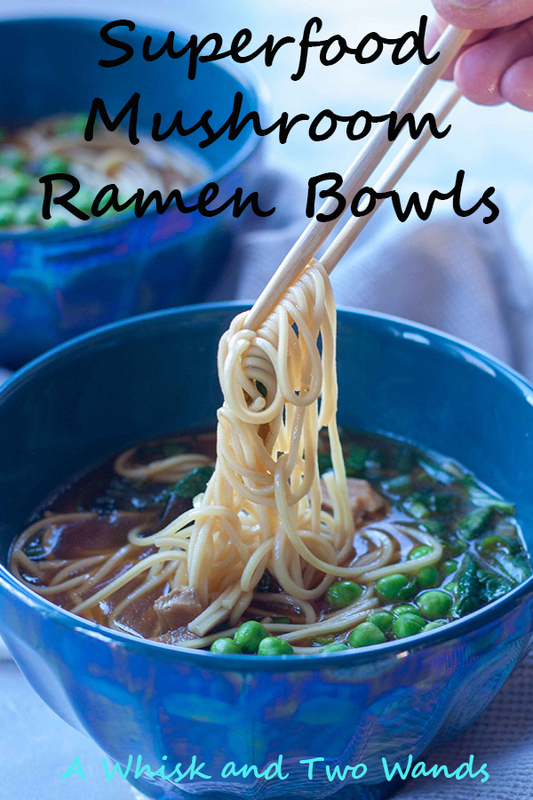 Ramen bowls were always quick and easy comfort food growing up and I use to want peas and ramen, like a whole bowl of peas, broth, and a few noodles. While there is the not so healthy ramen that many ate as a staple in collage or teen years done right it can be very healthy and doesn’t take a whole lot more work then the packaged kind. I think it was the girls having ramen in Ireland that had them wanting ramen when we got back home. 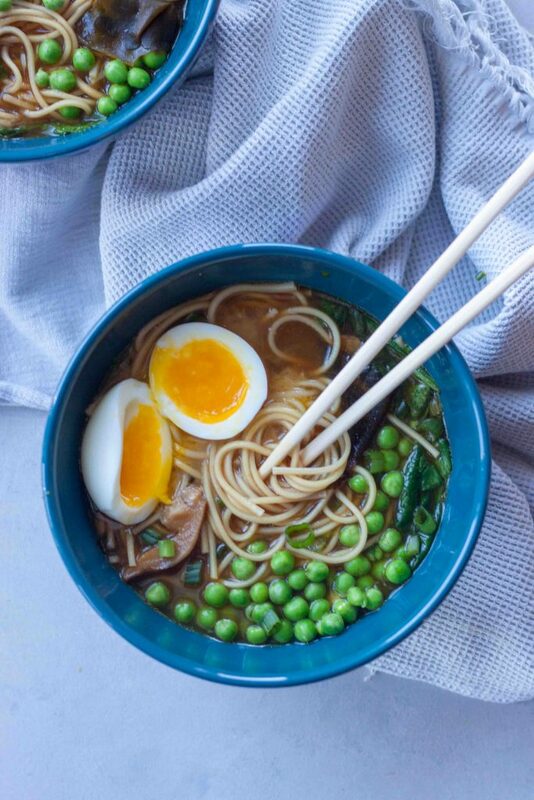 Using the ramen bowls I use to enjoy with all the peas and keep it healthy I started making them at home. In the summer and fall with fresh produce from our garden. 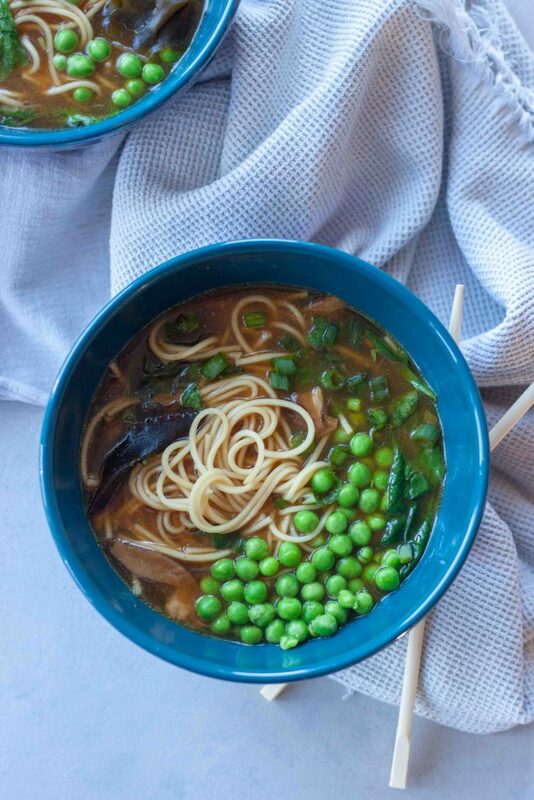 Sub zero temps and our garden covered in snow that isn’t an option in the winter but when comforting ramen bowls are craved most. 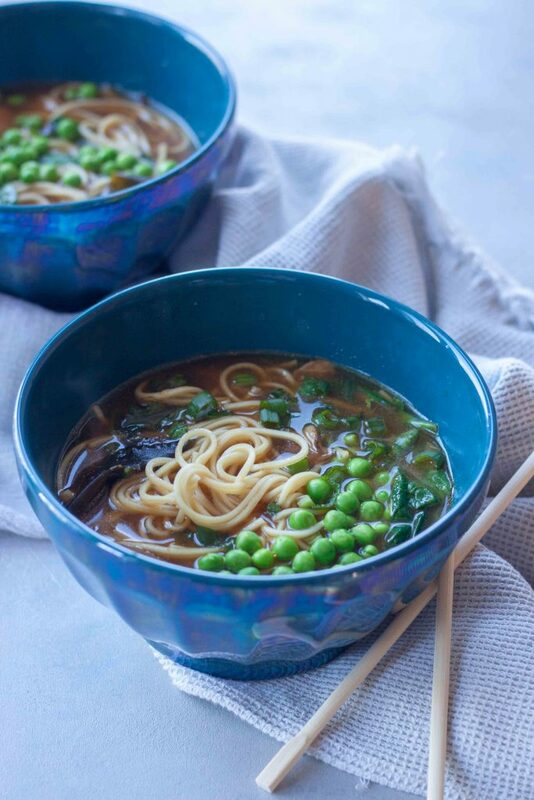 These Superfoods Mushroom Ramen Bowls are packed with lots of healthy goodness your kids probably won’t notice and may surprise you asking for more peas, I mean please. You can start with homemade or store bought broth, in this case I just listed broth if you’d like the homemade broth I make when I make a batch on the weekends or plan ahead let me know and I’ll share it in the comments or send it to you. During the week and to keep things quick and easy I always have broth on hand. From there using dried mushrooms, again having on hand and are actually more cost effective and staple ingredients like noodles, coconut oil, scallions, ginger, garlic, tamari (or soy sauce, liquid or coconut aminos), greens, and peas it can be pulled together in 20 minutes for a quick comforting healthy weeknight meal. From there you can add what I will call next level ingredients or additional optional ingredients. I’m going to continue to focus on this as everyone can eat healthy and I like to think of my recipes as inspiring. If you don’t like an ingredient or don’t have it there is usually a substitution. Starting with basic ingredients and adding additional options for healthy benefits or customization to suit individual tastes. I do this a lot in our house starting with a base and then we are able to customize from there without me making multiple meals and making everyone happy. As is this dish is plant-based and vegan unless an optional egg is added. For gluten free ramen bowls use rice noodles, as we usually do. 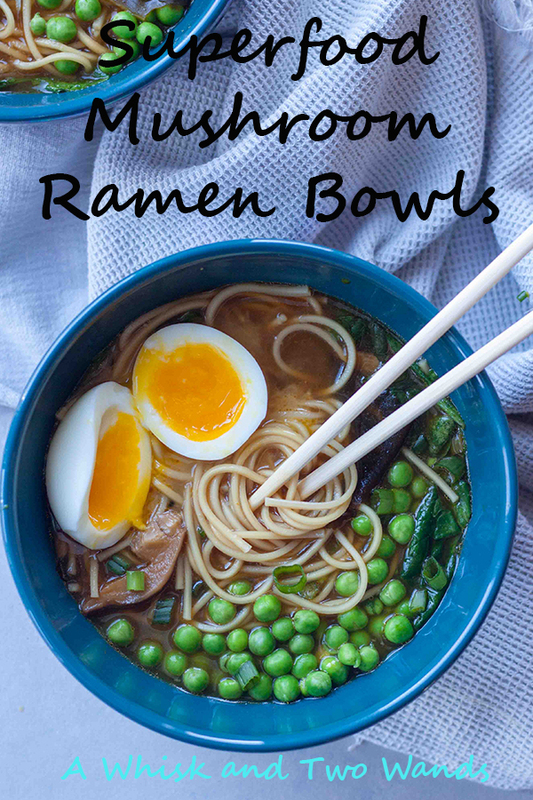 So additional ingredients we add to our ramen bowls aside from additional vegetables we may have on hand are wakame flakes, superfood mushroom powder, a soft boiled egg, and sriracha. Wakame is seaweed that is sold dried and has a long shelf life. It contains high levels of calcium and iodine and make a great addition to soups. Superfood mushroom powder can be a number of powders and as I said function mushrooms are one of the “trend” foods for 2018. I love my functional mushrooms consuming reishi, chaga, cordyceps regularly in drinks and smoothies. I use a 10 Mushroom Blend (from Four Sigmatic) that I have on hand for this soup that contains Reishi, Chaga, Cordyceps, Enokitake, Maitake, Shiitake, Lion’s Mane, Tremella, Agaricus Blazei, and Meshima. I use this blend to help support a healthy immune system and help my body deal with stress. The last two optional ingredients are a soft boiled egg that can be added to each bowl as desired and Sriracha if you want add a little spice. 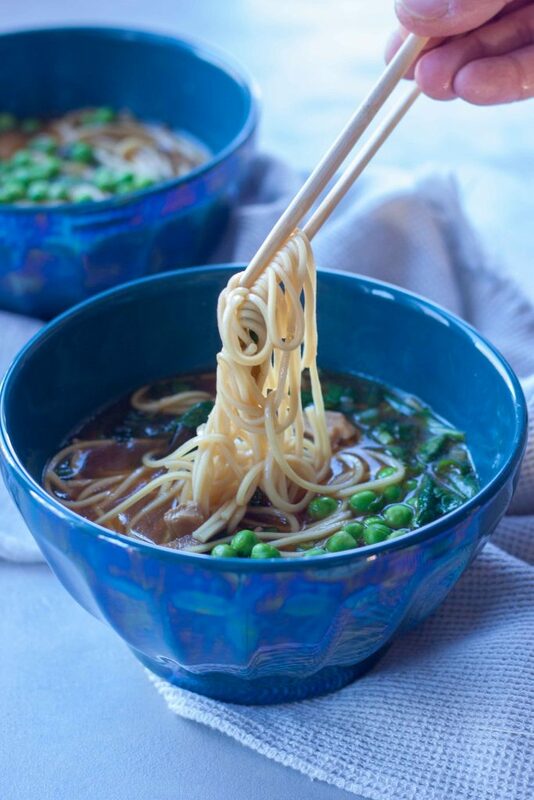 Any way you make it Superfood Mushroom Ramen Bowls are healthy comfort food that will hit the spot, especially during the sub zero temps we’ve been having. It was -15F a couple days ago, and that was the real temp not a “feels like temp” so I have a feeling soup will be on repeat this week. Today is still going to be cold so I’ll be snuggled up inside and soaking up the last day with the family before getting back to school, work, and routine. Maybe writing down some goals and wishes for the year which I’ve put off as I haven’t found a notebook (I like paper) yet. Guess for now I can jot them down on my computer or phone. Do you have any goals or plans for the year? I don’t do resolutions but I still have a mantra, goal, or things I want to accomplish in the year. The only thing I have so far this year is to try to spend my time doing things that make me happy and bring me joy. Start saying no to things that drain me and don’t bring me or my family joy, try to prioritize my time a little better because I always feel like I’m playing catch up and I want to enjoy life and the moments and not be stressed and drained like I I was much of 2017. My mom got me a real good book, The Subtle Art Of Not Giving a F*ck, and I will read it by the end of the month. Yes making time to read that and other books that I’ve gotten over the years just sitting on the shelf. 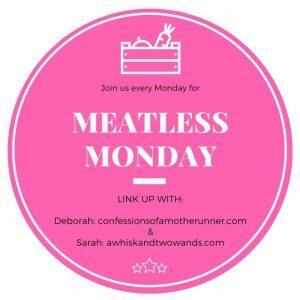 A new year and the first Meatless Monday link up with my co-host Deborah. As of right now we are keeping things the same but would love your thoughts on what you’d like to see this year, if you have any suggestions please comment below or send either of us a message. I look forward to seeing what’s cooking in your kitchen. 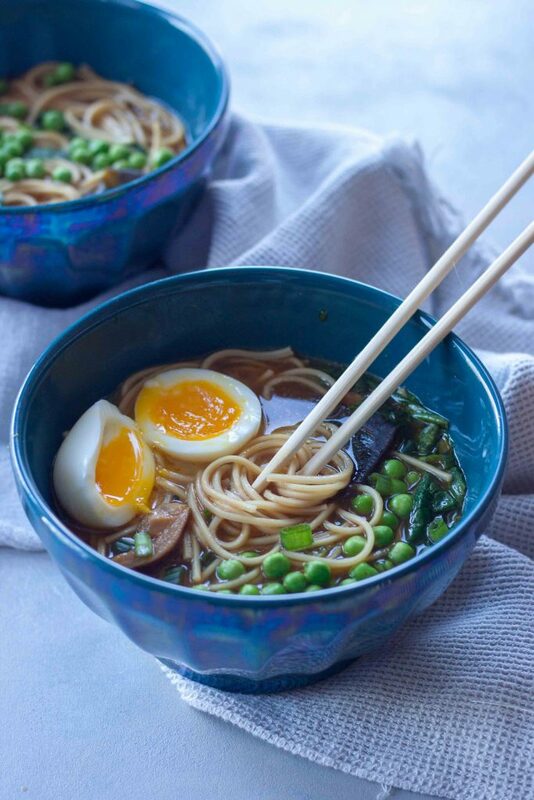 Good for you comfort food these healthy Superfood Mushroom Ramen Bowls are packed with greens, functional mushrooms, and optional additions including a soft boiled egg. Quick and easy it's a great weeknight meal. Put the dried mushrooms in large bowl and cover with 2 cups of hot water. Set aside for 20- 30 minutes, or until the mushrooms have softened. Strain the mixture, reserving the liquid. Coarsely chop the mushrooms. Heat oil in the bottom of heavy bottomed pot, Dutch oven, over medium heat. Add white parts of the scallion, garlic, and ginger. Sauté for 1-2 minutes. Add in the chopped mushrooms, sauté for an additional minute. Add broth, and strained (don't want to add in any grit) mushroom soaking liquid if desired for extra broth, and tamari. Bring to boil and then simmer. Cooke noodles according to packed instructions. Remove the pot from the heat and add the spinach. Cover and let stand until wilted, about 2 minutes. Ladle the soup into bowls and top with and egg, a sprinkle of the scallion greens, and sriracha (if using). To make optional soft boiled egg bring a pot of water, with a generous pinch of salt, to a boil. Carefully add eggs and cook for exactly six minutes. Remove the egg with a slotted spoon and transfer it to an ice bath. Very carefully peel the egg and add it to your ramen. If slicing slice in half with a sharp knife over the bowl. Like it, PIN it for later (vegan and egg option)! I have been into making ramen lately too. I have not tried adding the dried mushrooms or mushroom powder yet. Great idea and perfect for this chilly weather. Happy meatless Monday! It makes a comforting dinner when it’s cold out. Mushrooms aren’t the girls favorite but they don’t notice the mushroom powder. These sound perfect for the cold weather I will be returning to In CT this week! You pictures are absolutely fantastic! Happy New Year. So perfect for the cold weather, we finally got above zero for the first time this week but it was short lived. Hope you’re staying warm and save travels back to CT.
Yay for ramen! It’s one of my favorite things to have during this time of year! I love how perfect those eggs came out! It’s the cold weather that has us craving it. Thank you, I got lucky because they don’t always turn out nice, especially when trying to cut them.